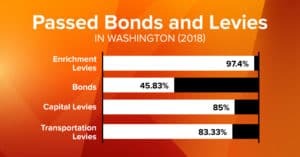 11 out of 24 bonds passed. An additional 11 bonds would have passed if we had simple majority for bonds. Because of lack of classrooms, some students will not have the same opportunities as districts who can pass bonds. Every school district has different needs, but it is likely that some of the districts cannot provide all-day kindergarten for all of their students, because they don’t have the building space to put the classrooms in. And, it is likely they won’t be able to receive the additional funding for all day K that the school districts who have classrooms will receive. This creates an inequality of education for students, just because they don’t have enough classrooms. It also appears that the school districts who did not pass their bond, for the most part, exceeded the state average for poverty. The very children who need access to kindergarten the most may not be attending. This is the beginning of the achievement gap that we are working hard to eliminate. In addition, on the other end of the education spectrum, all school districts are supposed to implement an additional year of science next year. Science classes require science lab classrooms. Without the money to retrofit existing classrooms into science labs, or to build new classrooms, it is very difficult for the school district to meet the required 3 classes of science. The state is mandating the science classes because our state has extraordinary opportunities for our students in the Science, Technology, Engineering, and Math (STEM) arena. For our children to get these living wage jobs, they need more science. Again, we are creating an inequality, and frankly an inequity, for some of our poorest communities. We need to work together again to pass Simple Majority for Bonds. Too many of our students are not getting what they need and deserve. 51 out of 60 capital levies passed. Capital levies cover a lot of the costs of maintaining or retrofitting our classrooms and schools. The capital levies can be used to bring in technology, fix roofs, upgrade HVAC systems, and improve water systems, just to name a few of the possibilities. Capital levies bring in additional money into the school, so money that should go to learning can continue to stay in the classroom. The state does not fund these types of upgrades, so capital levies are run. Capital levies are easier to pass in those school districts that have more property owners, and therefore spread the costs out more. Again, we are not funding our students equally or equitably. There could be an impact on the donor districts, the districts in Puget Sound that, through their taxes, send money to the rest of the state. Many of the school districts who passed in the 50-55% rate were in the Puget Sound area, and they may be seeing some resistance to and/or confusion about increased taxes. We need to watch for this in the future. Thank you to each and every person who helped to pass their bond and/or levy campaigns this year. It is a lot of work that you do for your students and for your community! The map below shows the recent results for the Enrichment Levy elections across Washington on February 13, 2018. The map compares the recent passage rate with the level of support a district’s current levy had when it was passed by voters. The comparison year for district ranges from 2014-2016, depending on when their levy was most recently passed by voters. This data was taken from OSPI’s School Financing Elections data. To see the map legend, just click on the double arrow button in the upper left corner.